Proper food for kids. Nutritionist approved. 1 of 5 a day. British chicken. Low salt. No added sugar - contains naturally occurring sugars from fruit & veg. No additives or preservatives. We make our chicken pie with British chicken and veg in a cheese sauce and top it with potato & veg mash. 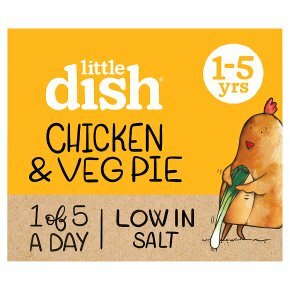 Our Chicken & Veg Pie is best cooked in the oven. Please do not reheat. All microwaves vary, these are guidelines only. Always test the temperature before serving.